The senior Chinese security official seemingly vanished while on a trip home. 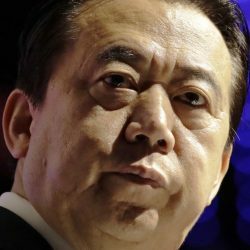 PARIS — Interpol said Saturday it has made a formal request to China for information about the agency’s missing president, a senior Chinese security official who seemingly vanished while on a trip home. China, in the midst of a weeklong holiday, has yet to comment on the 64-year-old security official’s disappearance. Calls and faxed questions to the foreign and public security ministries went unanswered. Meng’s wife says she hasn’t heard from him since he left the French city of Lyon at the end of September. France has launched its own investigation. French authorities say he boarded a plane and arrived in China but his subsequent whereabouts are unknown. In addition to his Interpol post, Meng is also a vice minister for public security in China. The South China Morning Post, a Hong Kong newspaper, has suggested that Meng may have been the latest target of an ongoing campaign against corruption in China. His duties in China would have put him in close proximity to former leaders, some who fell afoul of President Xi Jinping.